About 10 years after their first, critically acclaimed performances of Lou Reed’s adventurous album, zeitkratzer presents an audacious new interpretation of this 20th century avant-garde classic. Here, for the first time ever, all four parts of Metal Machine Musicplayed by zeitkratzer on one recording! Seriously „clangorous“! This new version of Metal Machine Musicis even more transparent, instrumentally pure and radical than the shortened 2007 release; live recordings from concerts in Rome and Reggio Emilia, Italy, mixed and mastered by Rashad Becker. A real sound experience! After their first performances in 2002 (documented on the 2007 CD release on Asphodel) zeitkratzer gave Reed’s album a new thorough listen and transcribed the sounds to create an acoustic score for the ensemble to play live. Those familiar with the oft-criticized two-disc album might wonder how they pulled this off, but they did and their interpretation of the work brought it to the attention of a wideraudience. 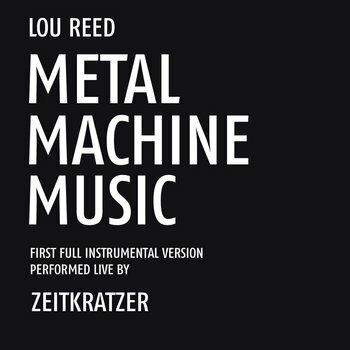 It is therefore partly thanks to the zeitkratzer version that Lou Reed’s Metal Machine Musichas been rediscovered as a classic of the Twentieth Century. It was at the live performance with zeitkratzer in Berlin, that Lou Reed spoke for the first time in public about the musical details of his composition, in an interview with Diedrich Diedrichsen. Metal Machine Music has become even more intense and worked out during the ten years of zeitkratzer playing it live at numerous international festivals – contemporary music festivals, noise festivals, improvisation festivals, – it’s impossible to limit this music to one genre. Metal Machine Musichas gained a new quality of clarity, sound transparence and musical intensity. Real radical contemporary chamber noise music! These recordings from the FestivalRomaeuropa in Rome and the Festival Aperto in Reggio Emilia (2012) presentzeitkratzer not only at their very best, the splendid mix by Rashad Becker also reveals new aspects of this 20th century avant-garde classic!